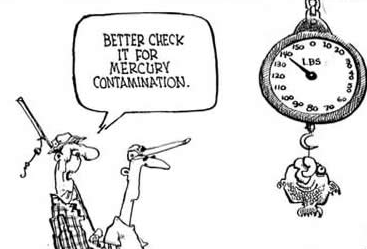 On June 5, the IPC published a blog regarding the mercury content in fish. In the blog, the FDA recommended that people may want to limit their consumption of fish with high mercury content, especially women who are pregnant or may become pregnant, nursing mothers, and young children. This is because the high levels of mercury found in some fish can have harmful, brain-damaging effects in a fetus. However, fish high in omega-3 fatty acids has also been shown to help fetal brain development. So what should a pregnant woman do? Pregnant women may now have new guidance from a study published October 8 in the Archives of Pediatric and Adolescent Medicine. Researchers from Brigham and Women’s Hospital and the Harvard School of Public Health found that prenatal mercury exposure in pregnant women may be associated with a higher risk of attention-deficit hyperactivity disorder (ADHD)-related behaviors. Women who had high levels of mercury in their hair (1 microgram per gram or greater) soon after giving birth had a 40 to 70 percent greater likelihood of having children with signs of ADHD at eight years of age. It is important to note that behaviors were assessed by symptoms only, not clinical diagnosis. Interestingly, the researchers also found that eating fish may help lower these risks to unborn children. Pregnant women who consumed two or more six-ounce servings of fish per week had children who had a 60 percent lower risk of developing ADHD-related behaviors. These findings underscore the difficulties of balancing the benefits of fish intake in pregnancy with the detriments of low-level mercury exposure of high fish consumption. While this study indicates that it is beneficial for pregnant women to eat fish, care must be taken to avoid fish containing high levels of mercury. The U.S. Food and Drug Administration and the U.S. Environmental Protection Agency have recommended that pregnant women eat no more than two six-ounce servings per week of low-mercury fish, such as shrimp, canned tuna, salmon, pollock and catfish. Over the last year or so, several news stories have appeared discussing potential toxicity of what are called “heavy metals” such as mercury in fish, lead and cadmium in toys, and arsenic in foods and juices. To help you sort through the facts, fiction, and fears of these stories please feel free to consult a specialist at the Illinois Poison Center by calling our toll-free hotline at 1-800-222-1222.